October’s program, PAC-MAN, may leave you a bit confused. Inspired by that iconic arcade game, this version has no graphics. It does have dots, cherries and ghosts. It doesn’t, however, have any pictures of those elements. Give it a try and you’ll see what I mean. Still confused? Don’t be. I wrote the original version of this program on a teletype machine that didn’t have any graphic elements. I wanted to write a game and drew upon the classic only to add familiar elements. The program is simply a choose a number game with a random element to end play. There is a trick to this program that will prevent you from dieing, but I leave that for you to discover. For many, the thought of playing a game without a controller is a foreign concept. 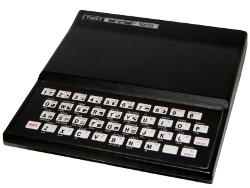 My ZX81 never saw a controller and many computers back then didn’t either. Graphics also took away precious memory so many programs didn’t use any. In my case, I didn’t use graphics because the first computer I used didn’t have any. I was just starting to program and the idea of managing characters on a screen was still a foreign concept to me. This program uses a simple input routine to get the number of dots to eat. I do some simple error checking to make sure you don’t cheat before determining if you get a bonus or are eaten by a ghost. That is really all there is to it. Consider this an early lesson in programming. With all the flashy mobile programs of today, it is good to look back. I still love to reminisce over the early days of home computers. My girls grew up in a world where video game consoles were already well established and they barely remember 16bit consoles like the Super Nintendo. My first video game was a simple pong system on a black and white television. My how the world has changed in 30 years.